When the Cold War was over so was the threat of a nuclear war that loomed over the world. But once again tensions are at their peak between the US and Russia, with both sides boasting new rockets, arms and doctrines, politicians and media stirring up confrontation between the two nations. Should we fear the unthinkable one more time? 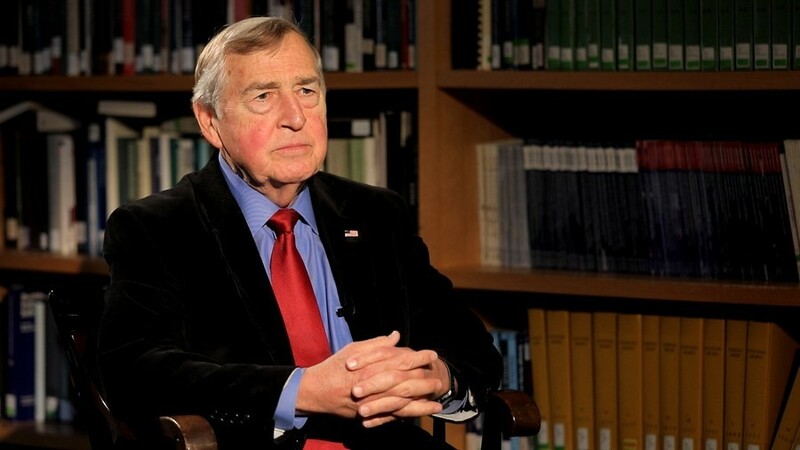 Former Pentagon adviser and leading national security expert Dr. Graham Allison joins to discuss. Sophie Shevardnadze: Professor, it’s really great to have you on our programme. Welcome. Graham Allison: I’m happy to be here. SS: Lots to talk about, lots of things going on lately. Putin gave his state of the nation speech recently and unveiled his new military arsenal, super-capable nuclear weapons, basically laying down the marker, he said: “They weren’t listening to us before, now they will have to listen”. Do you really think, this whole confrontation is all about not-listening? GA: That’s a good question. So basically what’s happened to the state of U.S.-Russia relations is tragic. And I think, there’s more than enough blame to go around. So, I think, both governments are talking more than they are listening. That’s certainly right. But, I think, in the American perception of Russia it has now become so politicised that it’s very hard to assess any thing to see. And, as far as I can understand, in the Russian perception of whatever is happening in U.S. it’s also highly politicised. So from the perspective of most of Washington demonising Putin and Russia is good politics and in any case makes people feel better. And for Putin and many Russians, including some of my friends, demonising Washington and its politics is good politics that works for the campaign and makes people feel better. And what they fail to ask, I think, is “does this make us feel safer than we were before? Or is this leading us to a more dangerous world?” And I’m afraid the latter. SS: So even during the Cold War, the actual Cold War, there still was a working framework of communication between Moscow and Washington. During the late Obama years, the communication’s been all but cut. What’s not talking to Moscow going to achieve? How is not talking going to pressure it into anything? GA: Well, I have long been of the view that not talking is dumb. So I’m an old Cold Warrior, I worked for the Reagan administration and Reagan would often say to conservative Republican supporters: “I hate the Evil Empire, my objective is to undermine the Evil Empire, but not to talk to my Russian counterpart given that he has an arsenal that could cause the U.S. to disappear would make no sense. I have to talk, I have to negotiate, I have to ask about how we can reach agreements so that we could constrain our competition”. So one of the great lessons very hard to learn during the Cold War was that two deadly adversaries still, if the reality is that: if we end up in a war I kill you, but also you kill me. So if that’s the circumstance, then that’s the choice either of us can make any day, but that choice is a suicide. It would be crazy to allow that to happen by accident or on the basis of some misperception or misunderstanding. So what communication is about even among deadly adversaries and what constraints are about in the arms control constraints is making sure that any catastrophe that occurs will be a deliberate catastrophe because a sane Russian government will never have a war with the U.S. that would be suicidal for Russia. And the sane American government will never have a war with Russia, that would be suicidal for America. So one of Reagan’s proper stickers was “A nuclear war cannot be won and, therefore, must never be fought.” I’ve written actually at the beginning of the Trump administration that in some ways we should get back to some lessons of the Cold War. I don’t want to get back to the Cold War, though it may seem that we’re backing to some version of it. But lessons that were learnt during the Cold War about communication and constraints, I think, are very good lessons for today. SS: I mean, both sides would tell you right now that the whole military arsenal build-up right now and military doctrines and all that’s going on is for deterrence, not for the war. But I’m just wondering, is this how this is going to be right now - building up military instead of talking? Is deterrence the only way to communicate? GA: So, these are two separate vectors. Building up or building down our arms is one story. Talking and not talking, and even reaching agreements about constraints, is another story. I would prefer that the U.S. and Russia would be reaching arms control agreements like they did under Reagan, under Bush and under Obama to reduce arsenals. But even if U.S. and Russia are increasing arsenals - maybe especially if they are increasing arsenals, including new and different kinds of weapons - then communication and constraints become even more important because if you’re building up your arms and I’m trying to perceive what the consequences of that are for me, I’m building up my arms including new arms and you’re trying to perceive what the consequences are, the real factor is that if we end up in a war we’ll kill each other. So that’s a disaster for both of us. So would we like to have a chance of that happening by misperceptions or misunderstandings or accidents? Or would we like to limit that risk? And I think, sanity suggests we should limit that risk. And that’s the conclusion the American, the Soviet and the Russian government came to after having tried the other for some period of time. And I suspect in the current competition at some point this fact will re-emerge because it’s undeniable. I don’t think anybody has an alternative to Reagan’s bumper sticker, and if it turned down to be a war, a full-scale war, between Russia and the U.S. both nations will be completely destroyed. SS: I hope we’ll reach that point sooner rather than later. But we’re not there yet. Before we get there what, do you think, will happen to the New START Treaty between America and Russia that expires in 2021? I mean,Trump has called it a ‘bad deal’ many times. Putin is saying that the Americans are not upholding key agreements. Is it dead? GA: Well, I think, it’s certainly a big question mark. At the Munich Security Summit where I was two weeks ago there was this debate I was participating on: “Are we beyond the era of arms control?” Because both the INF Treaty which both Americans and Russians are accusing each other of having violated and now the expiration date of the New START would suggest that in the current mood - that is if nothing else changes in the relationship between the U.S. and Russia - that treaty will lapse. Now, does it make really all that much difference whether the U.S. has 1500, 2500, 3500 weapons that can reach the Soviet Union or Russia? No, excuse me. It’s just extra… I would say, overkill. And similarly in terms of the U.S. - would I worry a lot about whether Russia has 3500 weapons rather than 2500, or 4500? No. What I do worry about is the dynamic of the competition which then could lead to misunderstandings and misperceptions and accidents. That’s why, I think that talking and finding ways to agree about constraints is so important. I also believe that the aspiration that your grandfather, and Gorbachev, and Reagan, and Bush, and Obama, and Putin, and Medvedev had to try to reduce the role of nuclear weapons in the international affairs is the right idea. But, I would say, that experience has fallen victim to the competition between Russia and the U.S. today. And, as I said, I think, there’s enough blame to go around. SS: It’s all about who has the upper hand. Pentagon says it will be reviewing U.S. missile defense policies after Vladimir Putin has unveiled new arms, which, some say, was a response to America’s reviewing its nuclear doctrine. So this is never going to end - like ‘who has the bigger muscle’ sort of rhetoric? GA: If you go back to the Cold War, which I remember very vividly, in the Reagan administration Americans and Soviet leaders worried seriously about the prospect of a nuclear war. It was a real, vivid possibility because people could see the ways in which the dynamics had been unveiled and the possibilities of mistakes and misunderstandings. For example, there was one occasion when there was nearly a false alarm. That produced a reaction that could have produced the use of nuclear weapon that could have escalated into a nuclear war. Recognition of the danger of that is what ultimately led to the talks, to the negotiations, to the agreements. So I’m still hopeful that after a period of huffing and puffing people will get back to a serious agenda. But right now there’s not much evidence of that. SS: At the same time, just recently, President Putin wrote a letter to the CIA, thanking the agency for helping prevent a terror attack in St.-Petersburg; then you have Russia’s top spies visiting the U.S. top spies despite the sanctions. Are the agencies communicating and working together despite the fact that Congress doesn’t really like that fact? GA: That’s a good illustration. The reality is that Russia and U.S. whatever their differences share many vital common interests. Whatever President Putin says or thinks and whatever President Obama or President Trump says or thinks the reality on the matter is that terrorists who can do attacks on either are dangerous to both. So at one stage actually here in Boston where we had the Tsarnaev brothers the Russian intelligence service had given the Americans some information in advance. Unfortunately, they didn’t take advantage of it. In the case that you referred to, American intelligence gave some information to the Russians. Actually if you look at it, matters that really matter like, for example, the Iran nuclear agreement, that would have never been reached without very close cooperation between Putin’s Russia and Obama’s U.S.
SS: It was a diplomatic masterpiece that Trump is about to scrap right now! GA: Absolutely. And after the fact what President Obama said was: “Thanks to President Putin without whom this agreement would never have been reached”. That was correct. The common interests between U.S. and Russia are real as are the competitive interests. So, I think, the question of whether these are in balance in our perception of what’s going on is, obviously, at risk. I’ve written about this. This is a kind of a grotesque image but this is what I tried to explain to Americans but I think I would say the same thing to Russians. So I say to Americans: “Think of Russia as our insufferable, inseparable Siamese twin. So however dangerous, however self-destructive, however evil, however mischievous, however ugly, I’m tempting to strangle them but I have to remember if I give in to that I will kill him and I will have committed suicide”. And I would say to the Russians the same thing: “Think of Americans whatever else as your insufferable, inseparable Siamese twin”. SS: So when General John Hyten says that the ‘sole existential threat’ to the U.S is Russia today, more than ISIS, do you agree with that? Is terrorism not a problem any more to the Americans? GA: Well, in the new doctrine the larger threats are China and Russia, as the doctrine says, who are strategic rivals. And I think actually there’s something correct about that. I think, the ISIS and terrorism threat has been overbold in terms of the whole picture. But I think both in the case of China and in the case of Russia the fact that we’re strategic rivals doesn’t mean that one doesn’t have very significant shared interests. So the challenge and why that is much more difficult in statecraft, it would be easier if you had an adversary that you clearly dub ‘an enemy’ but with whom you didn’t have such crucial shared interests. But if you - however much I don’t like you, however much I think what you’re doing is mischievous, however much I think you’re actually trying to undermine my security, whether I think you’re behaving in a self-destructive way, whatever - if your vital systems are integrated with my own that I can’t find a way to separate ourselves I have to find a way to live with you. And if I have tried to find a way to live with you that means that whatever combination of humoring you, bribing you, threatening you, blaming you, praising you, whatever is required, because what you are interested in as Russians, or what Russian security experts should be interested in, is the survival and well-being of Russia first. And what Americans are rightly interested in or should be interested in is the survival and well-being of America first. The sad fact (but it’s a fact) is that we either survive together or we die together. SS: So one last question - Russia and China’s relations are cordial, but far from being a firm alliance. And you have said that the hostile rhetoric from America towards Russia may push Russia into the Chinese arms. Wouldn’t that be detrimental to America as well? GA: Absolutely. If you were displaying this from the perspective of geopolitics and you saw a rising China as the dominant issue, that’s a subject that I’ve just published a book about last year - "Destined for War: Can America and China Escape Thucydides's Trap?" - a wise American policy would be to find as many other big players who could be on our side at this challenge. And Russia would be a very good candidate for that. But I think the combination of Xi Jinping’s very artful policy towards Russia where he has established a great relationship with Putin, and American mistakes, I think, in dealing with Russia have led this relationship between Russia and China to become quite allied and quite thick that would be quite difficult now to undermine. Though in the long run Russian strategists understand that they are living beside a dragon. I’m sorry that I have to go but I appreciate the conversation. SS: Professor Allison, thank you very much for this interview. All the best of luck.